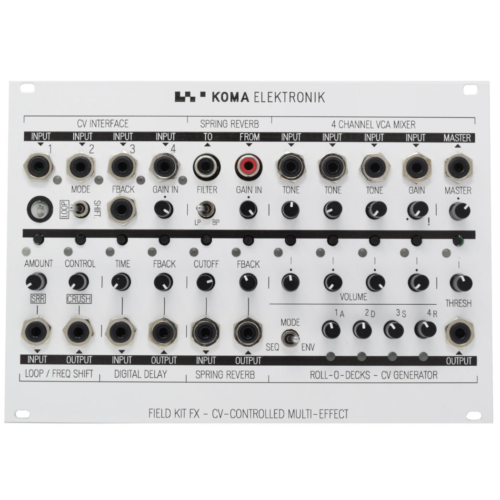 Eurorack version of the Field Kit FX by KOMA Elektronik is a multi-effect device for your audio and CV signals. The features include: Looper, Frequency Shifter, Sample Rate Reducer / Bitcrusher, Digital Delay, Analog Spring Reverb, 4 Channel VCA Mixer and a CV interface. 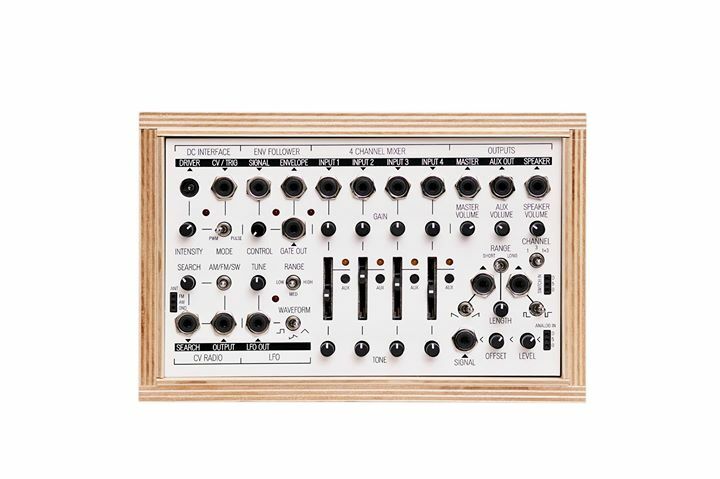 A eurorack version of the Field Kit FX. At the backside of the PCB you will find a power connector you can use to power the unit from your system. The total panel width will be 36HP. Our latest machine the Field Kit FX has been funded through the community at Kickstarter and is now available for order here on the KOMA website. The Field Kit FX is more fun with the right tools! You could add the FX Expansion Pack, which offers a spring reverb tank and other goodies! The Field Kit FX is built up from 7 separate functional blocks all focused on mangling and changing incoming audio and CV signals. They are designed to operate together as a coherent addition to our Field Kit Electroacoustic Workstation or alternatively together with other pieces of music electronics with the ability to use control voltage signals. The 4 Channel VCA Mixer is where all the signals of the Field Kit FX come together, providing a fully functional mixer with individual Volume and Tone control over each channel. We added CV control over the VCA so you can use your modular synthesizer, the CV outputs of your original Field Kit, or any other device to tweak the audio levels of the signals coming from the effects or feeding into them. The level of the Master Output can be set with the Master Volume rotary control, use the CV Select buttons to route the CV signals of the CV Interface to the separate channels. We like to push the limits with sound. Just like the mixer in the Field Kit, there is plenty of Gain to play with and the Tone control is a Low/Hi Pass filter that can drastically change the sound. One of the classic effects is the Spring Reverb, which – especially taken from it’s enclosure – is the experimentalists’ dream. You can touch it, hit it and use the physical properties to create spooky and unearthly sounds. We got so many requests of users of the Field Kit to add one, so we did. The Spring Reverb section in the Field Kit FX is Otto’s take on classic Spring Reverb circuitry and it rocks! He added a switchable Resonant Low Pass and Bandpass Filter in the audio path and a dedicated Cutoff rotary control to shape the input signal. In addition to that, we added variable Gain In, so you have maximum control over what you send into the effect. The Spring Reverb comes with CV control over Cutoff Frequency and Feedback. The Field Kit Spring Reverb works with a whole scala of reverb tanks! Please note: the Field Kit FX does not have a build-in spring reverb tank. You can use a whole scala of reverb tanks by connecting them to the Tank In and Out RCA connectors! Try playing around with different sizes. 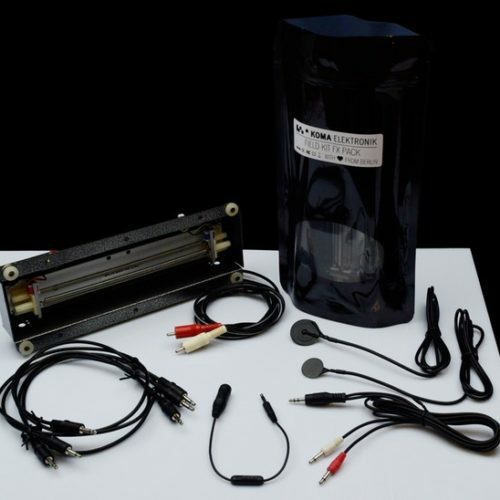 We offer a great high quality reverb tank in the Field Kit FX Pack (see below)! A super useful and interesting effect – and very popular here in the KOMA workspace – is the CV Controlled Frequency Shifter. A frequency shifter moves all audio frequencies by a given frequency amount, rather than a musical interval, like a pitch shifter. Technically, it modulates the audio onto a high frequency carrier wave, while filtering off one sideband and demodulated using a slightly different frequency. This gives super cool results. Small shifts in frequency can give you deep phasing effects. Larger shifts will allow you to enter a highly interesting sonic world, where for instance frequency differences which are related to a note give strange harmonic structures, which when the note changes give the weirdest sort of musical dissonance – which was a much used trick of KOMA favourite Karlheinz Stockhausen. For instance, when you input a piano sound and shift the frequency up you will end up with a piano which is very metallic sounding. When you shift the frequency down, the sound will be more like a membrane. You can change the sound of the Frequency Shifter with the Amount control, which allows you to set the frequency shift amount, and the Sideband control where you can tweak the harmonic structure. Of course both controls can be controlled via the CV Interface too. Not only a Frequency Shifter… Also a Phaser! The Field Kit FX Frequency Shifter has a special Phaser mode. Built as an easter egg you just have to find it! The Amount Control becomes the Rate Control of the Phaser and the Side Band Control becomes Phase Amount. The onboard Phaser sounds very liquid and natural and gets that funk on! The Digital Delay is another creation of Otto, where he tweaked known configurations of the PT2399 Delay circuit to a Digital Delay with KOMA character! Create crunchy delay effects, add additional effects in the Feedback loop and enter the endless echo space! Use the Time and Feedback rotary controls to shape your sound, both can also be controlled via control voltage! We added a Gain In rotary control to manually feed the signal into the delay path, which is helpful, since this effect can easily go into overdrive! Insert stereo 3,5mm cable to 2 mono 3,5mm cable to connect additional effects to the Feedback chain of the Digital Delay. Use the special stereo to mono in/out feedback cable (or insert cable) in our Field Kit FX Pack (see below) to take the audio signal out of the feedback path and plug it into other effects to make your delay sounds even more unique. Super useful for experimentalists and musicians alike is the Field Kit FX’s Looper. The looper can sample sound material up to 3 seconds in length and you can overdub this loop without limitation. Use the SRR rotary control to reduce the sampling rate and use the Crush rotary control to bit-crush the signal. Things get even more interesting (and way more fun!) when you modulate both controls with control voltages. This way you can create complex loops that keep changing their timbre and therefore create interesting sonic soundscapes and awesome rhythms. Also when you are not looping signals, you can use the looper section as a Bitcrusher and Sample Rate Reducer! Make a sinewave into a squarewave to scare that cat off your synthesizer. The Roll-O-Decks Mini Sequencer and Envelope Generator. A sequencer is always a handy source to have around when playing with effects. Use the different voltages that come out of the Mini Sequencer to automate different effect features, like the feedback of the Delay or the Cutoff frequency of the Spring Reverb’s filter. Route cv signals from one of the CV Interface’s inputs to the Threshold rotary control of the Roll-O-Dex and use incoming signals to trigger the different steps. Once no voltage is applied to the input, the Threshold control will act like a clock source, advancing the Mini Sequencer with every pulse. Just like the Mini Sequencer, the Envelope Generator creates handy cv signals to use with effects. It uses the four rotary controls to set the Attack, Decay, Sustain and Release phases of the envelope. If there is no CV routed to the Threshold pot, it will fire off repeatedly with the speed set by the Threshold control. If you route a CV signal to the Threshold, it will compare this incoming signal to the threshold and only fire if the CV signal goes above it. The awesome matrix inputs of the CV Interface. Once plugged in, the cv signals are routed throughout the device! The CV Interface consists out of 4 CV inputs that can be routed to 11 destinations on the Field Kit FX. These 11 destinations are the most important features that can be controlled on the machine. The four CV inputs are color-coded (Seapunk Blue, Chrisi Pink, Deep Dan and OG Orange). The eleven destinations have an LED and a little push button above them. When you press the button, the color of the LED changes and the CV with the same color is now routed to that control. Want to route your favourite LFO to the Delay Time? Simply plug it into one of the four inputs and press the small pushbutton above the Delay Time until the colors match. Every CV can be routed to every destination and every CV can also be routed to multiple places as many times as you wish.